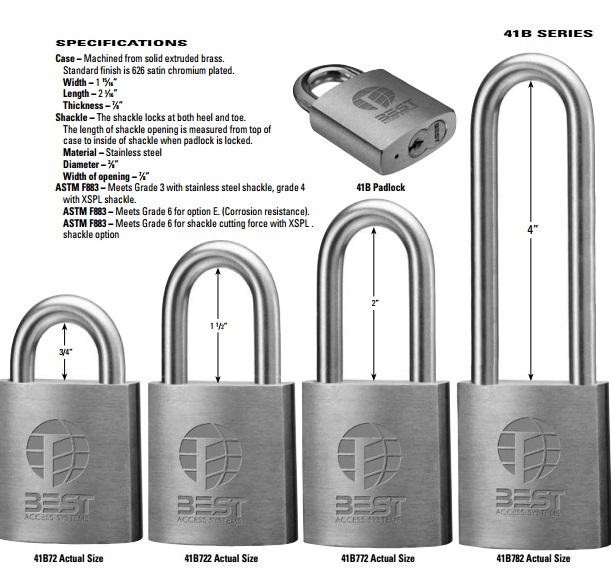 Best Access 41B Series Commercial Grade Padlocks are intended for use in Heavy Duty Commercial Applications and Provide Outstanding Performance. Height Options: Required*** 3/4" 1.5" 2" 4"
Shackle – The shackle locks at both heel and toe. The length of shackle opening is measured from top of case to inside of shackle when padlock is locked. ASTM F883 – Meets Grade 3 with stainless steel shackle, grade 4 with XSPL shackle. ASTM F883 – Meets Grade 6 for option E. (Corrosion resistance).